Dr. Sukitt Klangvisai 2006 18 72 6941 75 minutes from downtown. Rachakram Golf Club has great variety of hole lengths and designs, the par three holes are challenging at lengths of 193, 230, 206, and a short one at 136. The par fives all measure over 500 yards with the longest playing 557 from the championship tees, with the wind against you at times, these par five holes can play like they were well over 600 yards! There is plenty of water including a few blind water hazards, the centerpiece is a large lake 450 yards long and about 130 yards wide, large as it is, only four holes come into contact with it and two of them are long par five holes running along either side of it, apart from the big lake, there are five smaller bodies of water spread through the layout that require no fewer than five shots over water. The Ratchakram clubhouse is modern with excellent locker room facilities. This is a must play course that is gaining in popularity. 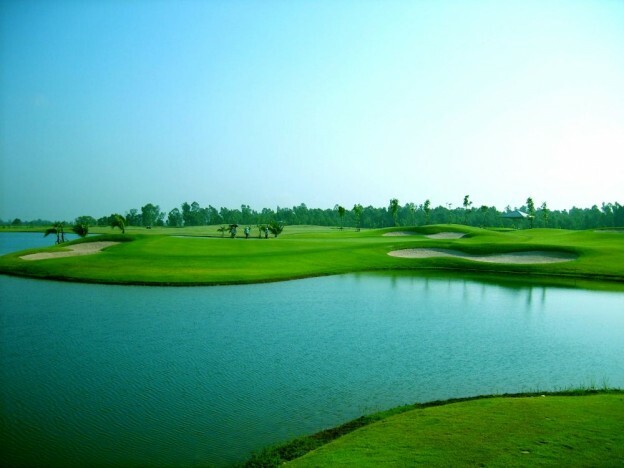 While the drive from Bangkok is slightly longer than some of the other Bangkok golf courses, you can get around the course in less than four hours if you want to, even on weekends, making the overall elapsed time quite reasonable.